I do not think it is good idea to buy Netflix these days, I have not been too happy with them, and recently I found myself watch prime video over Netflix and talking with my kids they too are not too happy with them. I think this rumor is being put out to drive up Netflix stock so investors can cut their loses at this point. Hulu and Prime Video seem to be the new game in town. I never, ever comment on BS articles, but this one made me create an account. How many times in the past has some analyst predicted that Apple would buy company X at some extravagant rate? Here is one: Apple will buy Phillip Morris so that Apple can make Apple cigarettes that will pull more users/addicts into the Apple ecosystem making Apple the first multi-trillion dollar company. There, now I am an analyst. "... the analysts claim there is a 40 percent chance that Apple will acquire Netflix ..." I wonder if Vegas has opened a book so we can all speculate. New Year same story, too much of a culture clash, and would be very difficult to integrate the two companies. Also there's something like a 70% - 90% chance of failing when it comes to big mergers. How many huge acquisitions have been successful over the years, very few and of those that were successful they were very specific or could have only benefited the specific company buying it. If we take a look at some of last years big acquisitions like Amazon and Whole Foods or Disney and Fox or CVS and Aetna, these all look like good deals but so did Aol and Time Warner, Google and Motorola and Microsoft and Nokia deals. I love the "40% chance" prediction. It's a can't-lose proposition. If Apple buys Netflix, they can say "see, we told you this was a logical use of Apple's money!" If they don't they can say "see, we told you it probably wouldn't actually happen." Personally, I'm of two minds about this. If Apple buys Netflix (which would surprise me), I'd be excited that my favorite company is doing something bold and exciting. But if they tried to restrict Netflix content to Apple devices, it would be a terrible decision from a PR and business perspective. And if they didn't do that, what's the point of buying Netflix? I guess there's a chance for everything but I do find 40% a tad bit high. The analyst may have slipped in one zero in there by accident, following New Year's celebrations. There is a 0.5% chance apple gives me $5 billion. Apple is going to spend $70B on Netflix. This person must be smoking the same stuff Gene Munster was when he said Apple would release a television set. You should see Citi's analytics chart, it's hilarious. I wonder how they come up with those metrics, what is the probability based on? Netflix is 10s of billions of Dollars in debt. The quality of its original programming (The Crown excepted...excellent show!) is dropping and other streaming services of late seem to be doing more interesting things. Not currently a great buy for Apple IMO. Huh! Have you heard of "Stranger Things"? I really don't understand this. There are two key drivers for Netflix, correct? 1) Original programming and 2) contracted streaming rights for third party content. How much is their original programming worth? And third party rights are time limited, can change, and may change if Apple buys them. And isn't Disney puling all/most of Disney/Fox content to go direct in the next two years? Might others? How different are their client bases? Apple would be better served putting a few billion into developing an array of productions for their own content, as it seems aggregation may give way to a direct model. Have enough exclusive iTunes content, and people will buy Apple TV's and invest in the ecosystem, making other providers compelled to continue to provide apps for the platform. It would be totally out of charscter to buy Netflix. They like to build their own. Apple could have used change in the couch to buy Spotify but didn’t. Plus the value of Netflix implodes when acquired because the content deals are void. Apple could also put its money into funding generic research for reviving extinct dinosaurs to populate a new theme park island with. Anything’s possible, right? So maybe Apple should have bought them 5 years ago? "Apple to buy Netflix" is a great rumor for Netflix shareholders and doesn't do anything for Apple shareholders. Netflix is now over $200 a share with a P/E of 202.x because of that rumor. That is damn sweet rumor for Netflix shareholders. Apple should create its own video streaming service and go head to head with Netflix and show Netflix shareholders some pain. 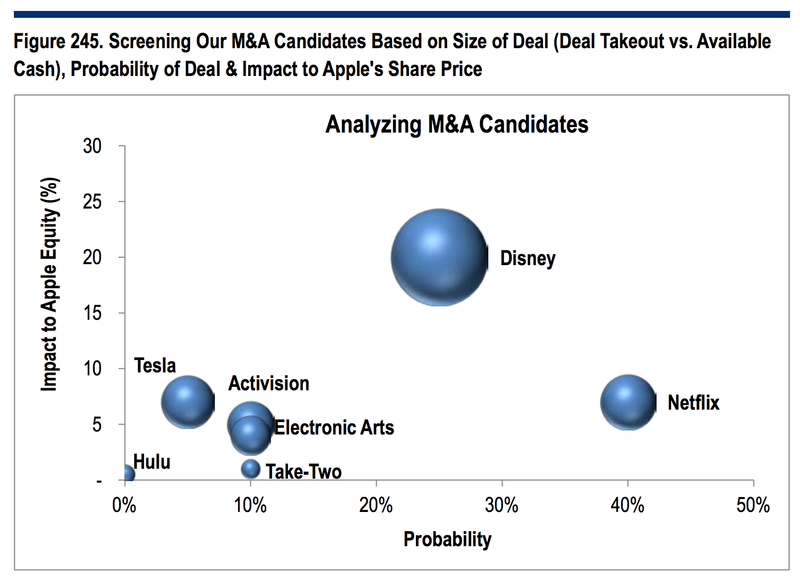 Even if Apple did acquire Netflix it wouldn't help Apple shareholders all that much. Wall Street would suddenly find a reason to devaluate the acquisition. I think Netflix is currently too expensive for Apple to be buying. I honestly think Apple can pull its own subscribers if the video streaming service Apple creates has equally as good content as Netflix. My only real complaint with Netflix is that the user profile doesn't stay automatically chosen. I find that annoying, but I find that Prime Video intermixing "free" and rentable content without a clear demarcation until you get to the paywall is more annoying. As much as I loved Top Gear (UK) I've barely even watched The Grand Tour, and I think it's because I dislike accessing their video portal… and that's despite loving their video player options, like X-Ray. Netfix’s current arrangements with studios would not survive a transfer of ownership. Their value as a company is mainly to their customers, not to an acquiring entity. In other words, these armchair analysts at Citi are frauds. Probably just an attempt at stock manipulation. Apple would be better off spending that kind of money on their own original content...if in fact they're really that committed to original programming in the near future. That remains to be seen.